Captain's Log Starship 1XE, Day 5 in the month of May in the Earth Calendar Year of 2016. To drill or not to drill, that is the question. And it's a darn good one. Now I fly a Cessna 210 that is one thirsty ole gal. We burn around 17 gallons an hour in cruise, and on climb out, with the pedal to the metal, we burn over 22 gph. Hence, when I am often interviewed I make sure I use my patented phrase, "EcoFlight is not against oil and gas drilling but we feel very strongly that it CAN and MUST be done properly and there are places that it just should not be done". As winter is slowly receding (yes, it was still snowing last week in the high country of Colorado), the valleys are being revealed in all their shades of green splendor while the haute montagnes are alive with brilliant whites from recent storms. On this mission, I was on my way to meet a select group of people representing the Field Museum of Chicago and the Southern Nevada Water Authority. For the past month this mindful group has created a traveling museum exhibit presentation on the Colorado River that educates about the challenges to the great waterway, and the flora and fauna it supports. 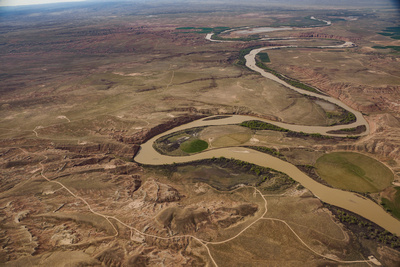 They are tasked with researching the Colorado River Basin and creating a compelling project to educate and advocate for smart management of a river on which seven states, two countries and nearly 40 million people depend. My route to join the group in Vernal crossed the Thompson Divide, and then flew onto Rangely, CO, and my destination. I was a bit startled after the lush terrain of the Divide that there was nothing but sparse rangeland and bottomland filled to capacity by oil and gas wells. The snow was gone, déjà vu all over again with a visual seasonal change, and all that was left as I looked around every acre along this route were roads, pipelines and well pads. I was blatantly reminded of our country's thirst for oil, and its impact to this landscape. These wells dot the landscape from the edge of the Thompson Divide all along my route: from the banks of the Colorado to the White River, a gold medal trout stream, and then onto the Snake and Yampa, and even along the banks of the mighty Green River itself. I gave our passengers our EcoFlight brand of an aerial educational tour, contrasting energy development with spectacular wild lands, all intrinsically related to the Colorado River. We started over the Uinta Mountains, where snowflakes melt into water, then flew from the hidden Gates of Lodore, over to the heavily developed lands surrounding the White River, the wild lands of the Dinosaur National Monument and on to the Ouray Wildlife Refuge on the Green River. Looking out over the Desolation Canyon of the Green River, it was apparent that important decisions must be made to balance the needs of energy with conservation, and hopefully set aside the more pristine areas for protection as we continue our quest for more oil. Climate change, environmental impacts, water availability and water quality, industrialization of the lands, economic and western values are all a part of the equation. In this part of the country, and in this day and age in Utah, these landscapes are up for grabs. Our flight contributed to the dialogue and positively impacted the researchers and their important work bringing the issues and history of the river to the current and future caretakers of this part of our planet. These landscape and energy decisions will last forever in this most fragile and vulnerable desert landscape. Home > Captain's Blog > May 2016 - To Drill or Not to Drill?